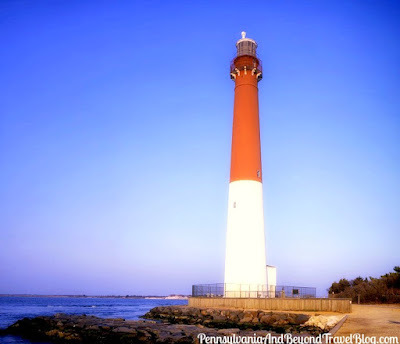 The Historic Barnegat Lighthouse is located in Barnegat Lighthouse State Park, on the northern tip of Long Beach Island in New Jersey. It was built in 1835 and stand 169 feet tall. Originally it was built 900 feet away from the water, but now stands 450 feet away. Locals refer to it as "Old Barney". Visitors can visit this historic lighthouse daily from April through October and then on weekends during the other months of the year. If you want to enter and climb the 217 steps to the top you'll have to pay an admission fee. There is an on-site interpretive center and gift shop. The interpretive center is a great place to start your visit. At the center you'll learn all about the history of the lighthouse, about the innkeepers over the years, about local area shipwrecks and more. Visitors will learn about the surrounding area, the coastline and learn about some of the wildlife that calls the area home. Barnegat Lighthouse State Park is a great place to visit for a family outing. They offer picnic grounds, fishing, walking trails, plenty of nature observation areas, and more! A lot of the areas throughout the park are handicap accessible. Throughout the year the park hosts various educational programs that are open to the public.